For me, the kitchen feels like the heart of our home. One whiff of my coffee brewing in the morning lifts and soothes my spirit. The sight, smell and taste of a particular recipe has the potential for such an immediate reaction, doesn’t it? I can’t wait to see what everyone brings to the table. This week was difficult in deciding what to share. as was the yummy pound cake, quiches, Cracker Barrel Copy Cat hash brown casserole, Homemade Cinnabon cinnamon rolls and three other breakfast casseroles. I decided on sharing my strawberry cheesecake trifle. The reason? It’s so incredibly easy, looks beautiful (even when you goof up like I did with the layering) and tastes even better than it looks. For those of you new to my blog, I love to shop at yard sales and thrift stores. A truffle bowl is a must for your “eagle eye” list. Not only does it display food beautifully, but it’s a wonderful decorating item for floating candles, displaying ornaments at Christmas, featuring flowers…oh, the list could go on and on. 1. In a bowl, toss strawberries with 1/2 cup sugar; set aside. 2. In mixing bowl, beat cream cheese, orange juice, and remaining sugar until smooth. 6. Repeat layers. Top with remaining cream cheese mixture. 7. Garnish with chocolate curl and strawberries if desired. My tip for attempting chocolate curls? Make sure you freeze the chocolate bar a bit before attempting. Although the ramification wasn’t too bad. Someone had to do it. Dig in and enjoy. But beware, it’s goes really fast! oh yay! You’re up! Too bad I have no tasties to share. Yours look divine. Jen, that looks amazing! I love trifles. I will definitely be making that sometime soon. It’s late, I almost linked into Mr. Linky! But since we have no food post that wouldn’t have worked. Kim and I are glad to see that Tasty Tuesday lives on! Have fun! I have made a trifle recipe that is almost identical to this one. You are right, it is fast, easy, and amazingly delicious! you make http://www.zcouple.com really get hungry.. I love the look of a trifle! Beauty! We love trifle around here, the idea of using cream cheese is a nice twist! I have LOVED all the recipes I’ve collected since becoming a blogger. Think I’ll be adding this one to the collection. I love the Tasty Tuesday party. Some really wonderful posts. Unfortunately, I didn’t post as I’d planned. This week we went out to dinner for Easter and my intention was to post some pics of our favorite dishes at our favorite restuarant. I especially wanted to show my favorite “Sizzelin’ Steak” which the restaurant is famous for. I mean they bring it out SIZZELING, and it is delish! Well, off I went with my camera and all my good intentions and before I knew it we were eating and having such a nice time that the only pictures I got were of half eaten dinners (they were kind of funny, you may have gotten a laugh). So, we certainly did have an occassion. We enjoyed our meal and I put the camera away after they made fun of me to the point of torture. We ate laughed and had a very lovely family afternoon. I hope I can come up with something for next weeks Tasty Tuesday Event. I actually can cook…lol. Do I need to give you my address for shipping purposes? Oh my that looks yummy ~ I will be making this recipe for sure! Looks delicious!!! I will be on the look out for one of those bowls. It’s now at the top of my list along with the bundt pan. YUM! It looks so good! I love the summer because it means strawberries are plentiful! I am going to have to file this one away! Thank you for sharing! All of your desserts look so yummy! Thanks for hosting! I love trifles and cheesecake, so this must be good! I’ve been looking for a strawberry triffle recipe! This looks amazing!!! Jen~ It’s just WRONG for you to start my day off by inducing a craving I can’t fulfill immediately 🙂 Your trifle looks absolutely delicious. I’m definitely going to give this recipe a try, but (I’ll confess it right now) I’m going to cheat just a bit. My latest discovery: the MOST mouth-watering poundcake I have EVER had (already made)…found at, of all places, “my” dollar store! oh my goodness that looks fabulous! That trifle looks so delicious. I wish I had some right now. Thanks for the recipe. That trifle looks so good! I am definitely going to have to try that recipe! That looks so delicious….I LOVE anything with strawberries!!! That looks so beautiful. You almost hate to eat it. But hey, it’s strawberry cheesecake! 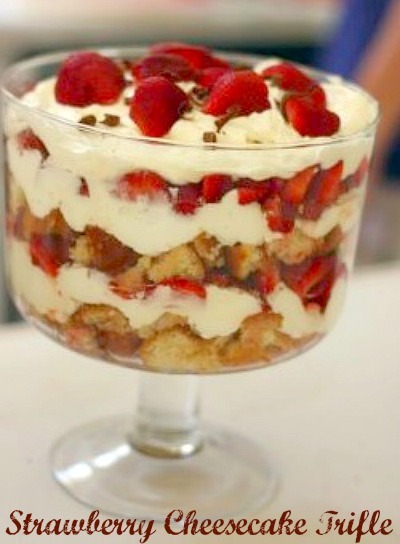 This trifle looks absolutely scrumptious. Love the cheesecake in it..
OH wow, that looks amazing. So does the stuffed cream cheese french toast. Please tell me you’re going to share that too? That looks fantastic! Thanks for sharing your recipe with us. Oh, these all look so yummy! Can’t wait to browse through. The trifle looks gorgeous. I’m definitely going to keep my eye out for a trifle bowl. Thanks for hosting Tasty Tuesday. I wasn’t able to do a post today, but I’m definitely browsing Mr. Linky! Hopefully I’ll post next Tuesday. That Trifle looks absolutely amazing! Thanks for hosting Tasty Tuesday. Love the new button for it. I can’t wait to visit all the other recipes here. Jen, You have done a beautiful job! Tasty Tuesday is perfect for you! Enjoy it! I finally finished my taxes, so I posted my salmon recipe! I notice all kinds of fun new things on your blog… it is looking good! I like your section buttons… and really love your beautiful “B” up in my web browser! How cool is that! Now I am off to browse what other yummy delights have been brought to the party. Blessings! You have been given the Sisterhood Award; swing by and pick it up =) Thanks for being a great place to find refreshment and a smile! Have a good day. Yes, I copy / pasted the html……no problem with the other 2 I did tonight…so who knows whats up! You can look a older posts …left side bar scroll down to Archives…for previous months. For current posts..they are listed on same side bar under Recently written. Hi there! So fun to be back online and to check out what you’ve been up to! I just read the post above and you mentioned the Covey book. My Mom helped write the Military version he put out. I love all of them~ very good reads! Wishing you and yours a very happy belated Easter. I am loving your blog header. How fun that is hun! I just want to say that you sure do seem to be a special lady and I think your family is fortunate to have you. You are so thoughtful. Thank you for your sweet words. I was wondering ..could I use cherrie pie filling instead of the strawberries? Yes, I think that would work well. Since the pie filling is much sweeter, just take that into account. Trifles are great. You can mix and match anything. I am making this for my BBQ tomorrow except I am going to use white chocolate instead. I can’traitor try it. Sounds delicious with white chocolate!